There is a wide space between the two characters in the still which shows a distance between the two boys, possibly due to something having happened ie. a break up or loss of someone or something important. 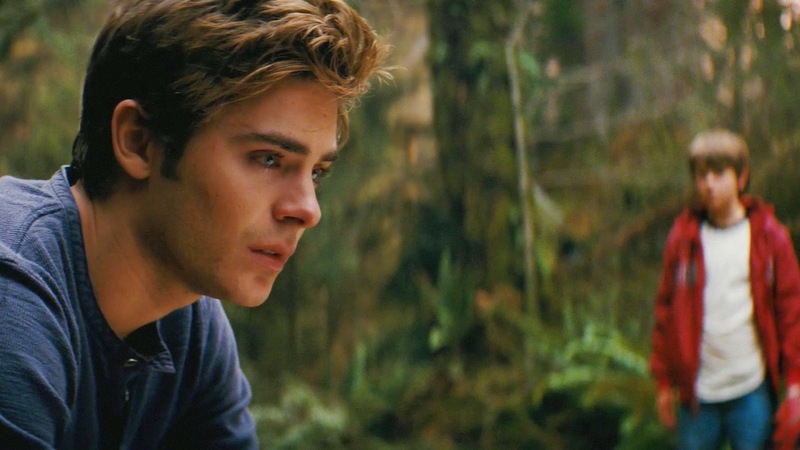 Zac Efron (on the left) looks to have a very solemn expression on his face and his eyes look like he has possibly been crying, this connotes a sad atmosphere as if something bad has occured. The framing has left some looking space, so you can see he is looking into the distance and the woods, which connotes that he is deep in thought. Possibly romance or drama. You can see the emotion on the young man's face, which connotes possible loss and sad emotions. The boy in the background is blurred which puts more attention on the older boy on the left, so you are more focussed on his emotions and expressions. Even though he looks sad, he seems calm and controlled, this along with the choice of a blue t-shirt connotes tranquility. The still is a wide shot, used to get in some background but also to portray the distance between the two boys. This gives the audience more background on the events as it almost seems to them like the boy on the right has said something to upset the older boy, which raises questions in the audiences mind as to what is going on. This still potentially makes the audience sympathetic for the man as he looks subdued, but also makes them wonder what has actually happened previously.